Here it is. My all-time favorite green smoothie. Everyone is busy these days. You have a job, (or two, or three! ), and a family. There is cooking, cleaning, and chauffeuring the kids back and forth between activities and social events can sometimes keep me in the car almost all day. There are some very good reasons I turn to this Ginger Banana Green Tea Smoothie to give me a boost when my energy levels start to drop and I still have a long day ahead of me. You will be amazed how quick and easy this smoothie is to prepare. It whips up in minutes with no fuss, simple ingredients you probably have on hand. Not only are the ingredients simple but cheap. Me and cheap are good buddies. It’s a great alternative to sugary drive thru drinks and you won’t have to worry about crashing a few hours after drinking this Ginger Banana Green Tea Smoothie. It will keep you going all afternoon. I pinky promise. Don’t let the simplicity of the ingredients for this Ginger Banana Green Tea Smoothie fool you into thinking they don’t pack a powerful punch. Let’s take a look at some of the benefits you will reap after enjoying your smoothie. Ginger is an amazing spice known to aid in digestion, help lower cholesterol, relieve pain caused by arthritis due to its anti-inflammatory properties, and can improve the absorption of essential nutrients in the body. One of the most popular uses for ginger is the treatment of morning sickness and motion sickness. Plus, its a good source of vitamin c, copper, manganese, magnesium, and potassium. So, for all of you out there who like me have a problem absorbing iron, this is great news since vitamin c helps your body absorb the mineral more effectively. Click here to get all the nutritional information for ginger. Apart from giving curries a vibrant golden hue, turmeric has been recognized by Chinese medicine and Ayurvedic for thousands of years due to its medicinal properties. This herb belongs to the ginger family so not surprisingly it has many of the same benefits we talked about earlier. Among some of the top uses for turmeric include treating anemia, detoxifying the liver, and promoting blood circulation. Have a cold? Yep, it can help relieve cold symptoms, too. It also has a good amount of dietary fiber which is something I can always use more of in my diet. In addition to using turmeric internally, you can also use the spice topically as an antiseptic to treat insect bites and minor cuts and scrapes, and as a face mask to impart a healthy glow. Should you decide to give a turmeric face mask a try it is suggested that you take care when measuring your ingredients lest you are eager to get your oompa-loompa on. I found a very informative article on all things turmeric on Fresh Bites Daily so head over and check out this post. 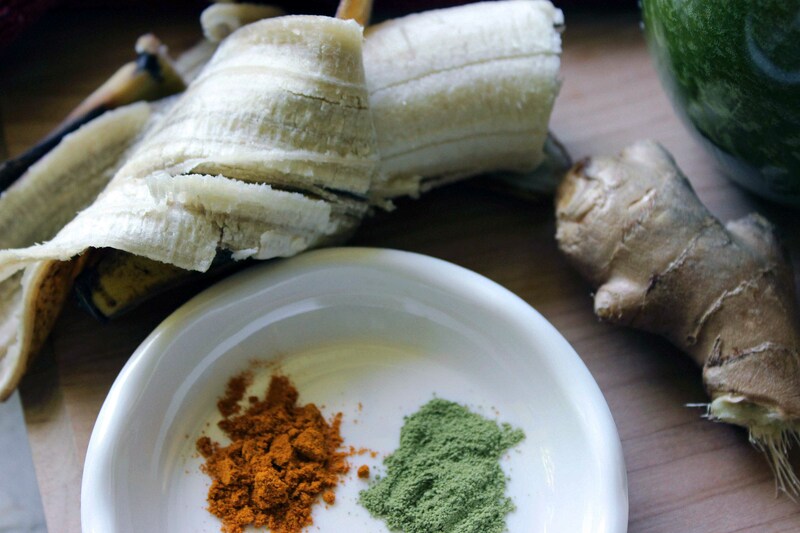 For this Ginger Banana Green Tea Smoothie I used matcha powder. Feel free to use a cup of brewed green tea that has been cooled if you don’t have the matcha on hand. Simply reduce the amount of pineapple juice or omit it altogether if you choose. The main difference between the two teas is matcha is the whole tea leaf ground into a fine powder which you mix with water and drink. Of course, green tea bags contain the leaves which are removed from the tea before you drink it. Essentially you are getting a greater benefit consuming the concoction containing the whole leaf as opposed to steeping the leaves and removing them. You can’t loose either way as both have many health benefits. Green tea can help you burn stored fat as energy and aid in lowering LDL cholesterol. Thanks to the amino acid L-Theanine, matcha green tea can help you focus and improve concentration while keeping you calm and zen-like. Of course it will get you going with a nice dose of caffeine but fear not, the L-Theanine will keep those pesky jitters at bay and can help maintain your energy levels for 6-8 hours. Last but not least, the EGCG found in green tea leaves is thought to be a powerful cancer fighting antioxidant. Whew! It’s amazing what a teaspoon of this powder can do for you. Matcha is a versatile ingredient that can be used in cooking, baking, and other food preparations. However, before you go out and purchase a big tin of matcha to use for breakfast, lunch and dinner, there could be higher amounts of lead found in matcha powder than regular tea. So like anything else, use moderation, perform a little research, and do what makes sense to you. Talk about hitting the spot. 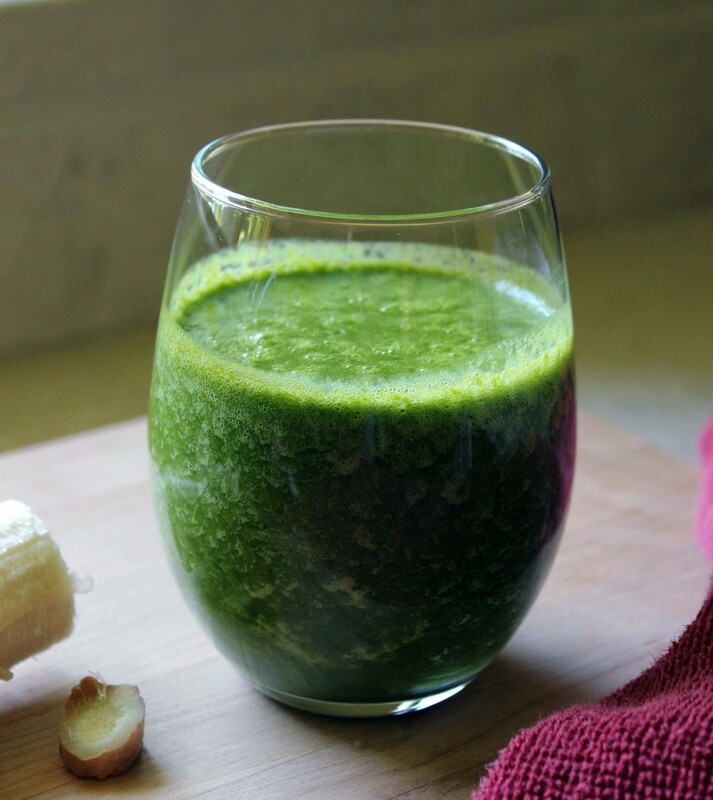 This Ginger Banana Green Tea Smoothie is refreshing and zippy. The ginger takes center stage here, warm and peppery with just a little bite that instantly wakes up your taste buds and gets your juices flowing. The pineapple juice and banana sweeten this smoothie perfectly and balances the bitterness of the turmeric. Matcha has a savory, umami feel that makes this elixir satisfying and smooth. 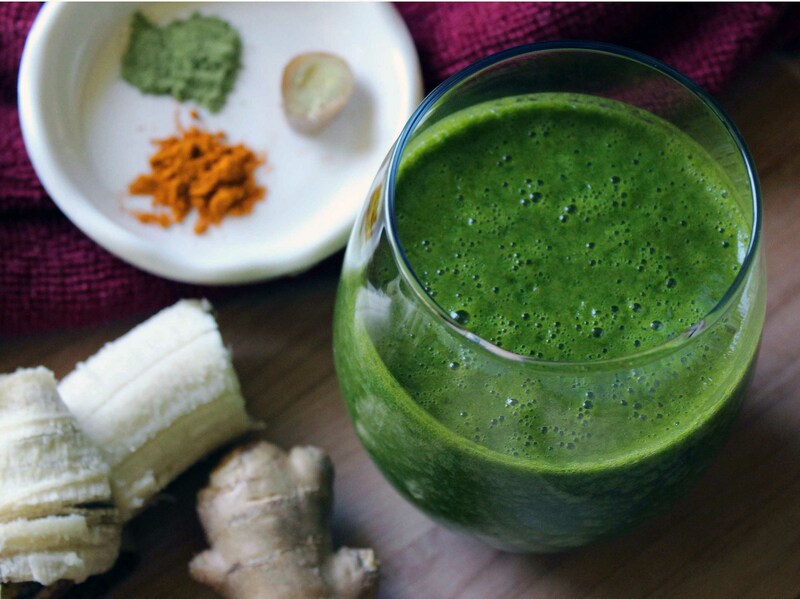 This smoothie will leave you happy and energetic and ready to take on your most challenging day. So what are you waiting for? Enjoy your smoothie and go get ’em! 2-3 handfuls of juicing greens. 6 ounces 100% pineapple juice. 1 inch piece fresh ginger, peeled and chopped. Rinse the juicing greens in cold water and place in a blender. Add the 1/2 banana, pineapple juice, matcha, turmeric, and ginger. Blend until completely combined and smooth.